Reporting functionality in PHPRunner provides a great way to present or print data in detailed and grouped formats with automatically calculated fields (subtotals, totals etc). 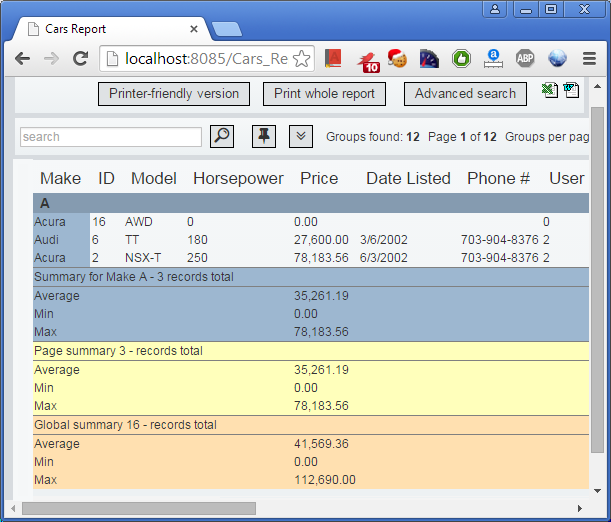 Reports can be based on single or multi-table queries. Using search form users can filter report data. Reports are often used to represent data in grouped, hyerarchical format. On Group Fields tab you can choose group fields, grouping types, what summary types to show etc. 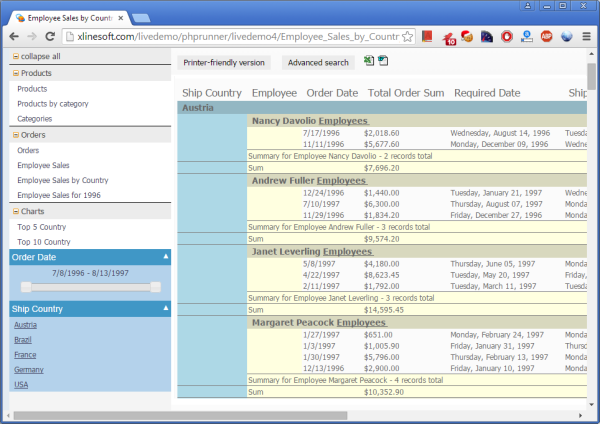 You can choose to show both details and summary or just a summary on report page. Besides standard intervals (new group starts when group field value changes) you can use other interval types. Available interval types are different for each data type. Here is the example of text group field using first letter as an interval. 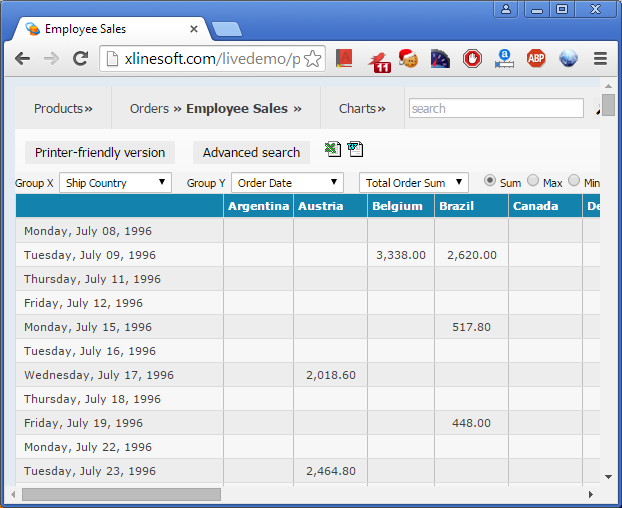 On Report Totals tab you can choose what fields to display on the report/search pages. Also you can apply aggregate functions like MIN, MAX, SUM and AVERAGE. The results of these calculations will be displayed after each group and at the end of page/report. Sometimes it is necessary to rotate results so that columns are presented horizontally and rows are presented vertically. 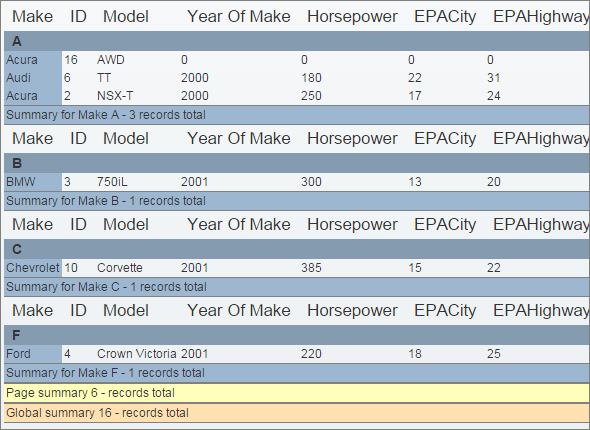 This is known as creating a PivotTable, creating a cross-tab report, or rotating data. I must say I am truly impressed with your phpRunner product. I have been looking for something like this for months. I had given up all hope and was had started to write the code myself when I stumbled upon phprunner in the phpbuilder.com website while looking for php-MySQL code snipits. I figured I had nothing to lose and downloaded phprunner, and after only 10-15 minutes I had my search php code up-and-running with professional results. This is such a code-pleaser. I have to comment on PHPrunner , I haven't written code in years, so I tried a few other generators and always found myself getting hung up somewhere on things they just couldn't deliver or terrible support, or non industry standard output. Then I found PHPrunner, I have had my copy for little over a week now and already have created a very impression building service desk application, only have reports and charts left to do. Thank you so much. You guys ROCK!